A field of eight go to post at the Curragh on Saturday for the Irish Oaks. Ralph Beckett’s Talent won the English Oaks at Epsom when powering clear of her stablemate Secret Gesture to win by over three lengths. Richard Hughes rode on that occasion with stable jockey Jim Crowley on the runner-up. Crowley will be back on board this weekend as Secret Gesture misses the race due to a minor injury. 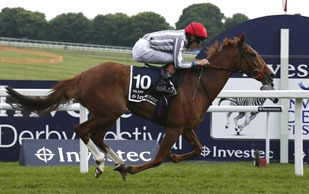 The biggest threat to Talent could come from Ascot Ribblesdale Stakes winner Riposte. The filly scored an emotional victory at the Royal meeting when providing Lady Cecil with a winner only days after the death of her husband, Sir Henry. Riposte was having only the third race of her career that day and holds Irish challenger Just Pretending on that form. Just Pretending is one of three runners from Aidan O’Brien’s powerful Ballydoyle stable. Just Pretending had previously made a bold bid for victory in the Irish 1000 Guineas before being reeled in by Just The Judge. Her Ascot run was her first attempt at a mile and a half but she appeared to get it well and looks set to run a big race. Joseph O’Brien will ride Just Pretending whilst Seamie Heffernan partners the progressive Venus de Milo and Michael Hussey rides Magical Dream. Venus de Milo was an impressive winner at Naas last time out whilst Magical Dream was second in a Group 3 event at Cork. The former is the shortest of the trio in the betting market at 7-1 with Bet365. Tommy Stack’s Alive Alive Oh has been declared but her trainer has expressed concerns over the quick ground. She has won her last two races when there has been a bit of give in the ground and connections may leave it until the last minute before making a decision on her participation. Jim Bolger is represented by Scintillula and Alain de Royer-Dupre is sending over French Oaks runner-up Chicquita. The French-trained filly ran right across the course when second last time out and had previously fallen after running into a hedge with the race at her mercy. Veteran jockey Johnny Murtagh has been booked for the ride.